Students pay no dues and do not have required meetings or faculty sponsors. NAEHS by-laws prohibit NAEHS from offering anything for sale to student members. Their only obligation is to share with others what adult education has meant to them and encourage family members to take advantage of their local adult education program. All enrolled adult education students are eligible for NAEHS membership including ESOL, ABE, Literacy, HSD and GED students. Many schools use the following Teacher Nomination Form to compile their nominees. These forms are given to the teachers and returned to the Adult Education director or a committee for consideration. The forms are not to be submitted directly to NAEHS. We receive only the nominees' names for imprinting NAEHS student membership certificates. Reminder - NAEHS does not require high student test scores for membership. 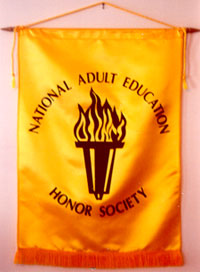 © 2006-2019 National Adult Education Honor Society LLC. All Rights Reserved.